If you are not using SharedView for interactive demonstrations then I urge you to take up the cause while the day is still young and the application is free. It provides the same kind of display features as Live Meeting, however, you are able to allow viewers to interact with the presentation in a more direct and intuitive way. Unfortunately as far back as last year I have been seeing issues with some demos where the video was completely scrambled, this was a problem with both SharedView and Live Meeting. Being a remote employee this kind of issue will simply not do. 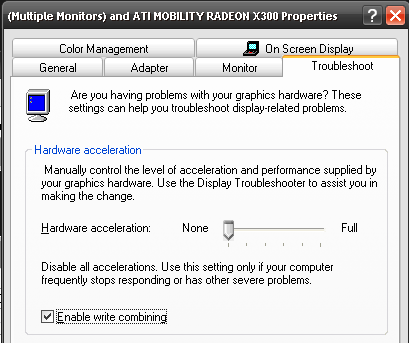 The problem is apparently related to the the hardware acceleration options. 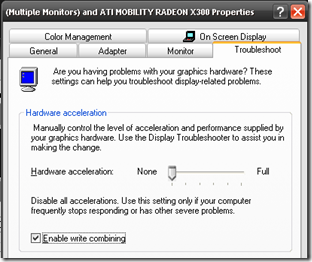 The presenter should update the Hardware acceleration slider to None as shown below and everything should work as designed! For more troubleshooting tips check out the SharedView forum.